The current financial crisis, may progress to a phase where people demand and hoard dollar bills but take electronic deposit credits only at a discount which increases until electronic deposit credits are repudiated entirely. The Federal Reserve would be powerless to solve the problem, because while they can create unlimited electronic deposit credits they can’t create unlimited paper dollar bills, “money you can fold” as Professor Antal Fekete calls it. There would be a glut of electronic deposits, but a shortage of dollar bills. Before the financial crisis metastasized in 2008, Fekete wrote a paper that I think is underappreciated and under-discussed. Can We Have Inflation and Deflation at the Same Time? In his paper, he discussed the “tectonic rift” between paper Federal Reserve Notes (i.e. dollar bills) and electronic deposits. By statute, the Federal Reserve cannot print dollar bills without collateral (e.g. Treasury bonds). Also, they have limited printing press capacity that is insufficient to keep up with a catastrophic crisis. He discussed the inverted pyramid of John Exter. 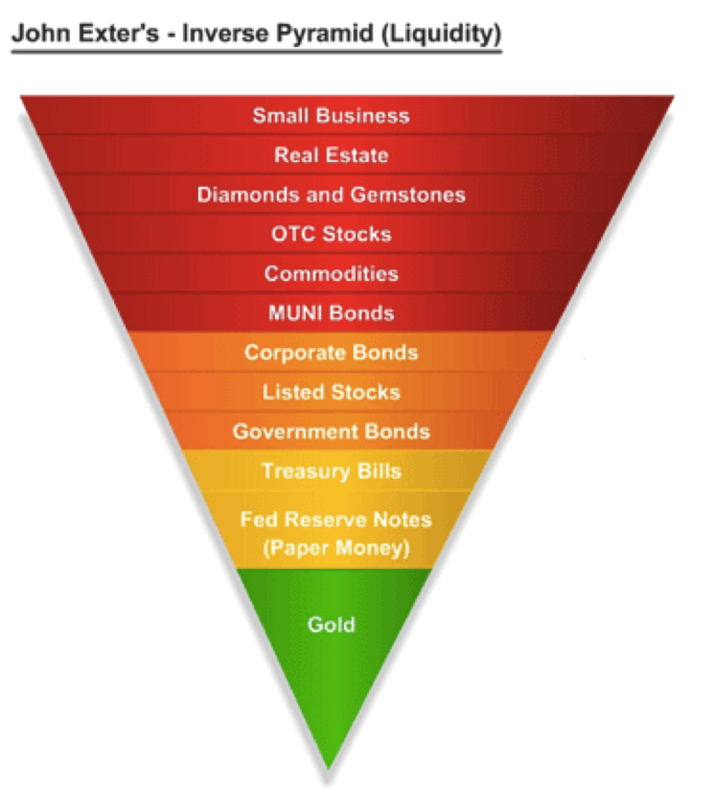 Gold is the triangle at the bottom, and then above is silver, dollar bills, and then the various kinds of electronic deposits, stocks, real estate, etc. In a crisis, people want to move from top to bottom of the pyramid, but of course there isn’t enough of the stuff at the bottom. In a scenario in which desperate, panicky people are trying to cope with the enormity of a collapse that they don’t and can’t understand, I think this split between “physical” dollars and “electronic” dollars is very plausible. Just as there is nothing to be accomplished by selling an underlying security as it becomes worthless, only to buy a derivative of it, selling Treasury bonds and buying dollars is equally nonsensical. The dollar is the Federal Reserve’s liability, backed by the Treasury bond as the asset. If you believe the Treasury bond is worthless, then you ascribe no value to the dollar either. This is why gold will go into permanent backwardation. Holders of dollars will provide an unlimited bid for gold that will not be reciprocated by holders of gold. The latter own the only safe asset, and the only monetary asset that is not ultimately backed by the Treasury bond or the dollar, and they will have no desire to give it up. The concept of backwardation is simple. It is when people accept a future promise to deliver only at a discount to physical stuff handed over right now. This could be when there is a shortage, such as wheat before the harvest. Or in the case of gold, backwardation signifies a collapse in trust. But isn’t this the same phenomenon of a tectonic rift between paper dollars and electronic deposits? In a certain sense, the “money you can fold” behaves like a physical commodity, a present good (I realize I am stretching the concept here more than a bit). The electronic deposit credit is most definitely a future promise. In my gold backwardation thesis, the action begins with the offer on the futures contract falling below the bid on spot gold. The bid-ask spread on spot gold widens, as the offer is relentlessly advancing, pulling the bid behind it. The bid-ask spread on the futures contract also widens, as the offer remains stubbornly high, but the bid withdraws and retreats as gold buyers don’t trust futures and buy physical gold instead. Eventually, there are no more sellers of physical gold and that is that (except for the dollar-commodities-gold arbitrage, a backdoor way for dollar holders to get a little gold before the end of the game). If this split occurs in the dollar, I think it will play out the same way. At first, sellers of real goods may accept electronic credit money, but demand a higher price. The spread on the electronic dollar widens, with the bid from real goods falling. At the same time, virtually unlimited demand for the “real” paper you can fold causes the bid on the paper dollar to rise. Who knows how long it could last? People could go on accepting paper dollars out of long habit. Obviously, this is an unstable situation that must necessarily collapse. Unlike gold, the paper dollar has no value other than the broken promises that back it. I dub this “dollar backwardation”. This entry was posted in Uncategorized on May 23, 2012 by Keith Weiner.